Elkhorn Public Schools (EPS) is one of only three Nebraska school districts, and only 373 districts nationally, named to the College Board’s 9th Annual AP District Honor Roll. For the seventh consecutive year, EPS has increased the number of students participating in AP courses, while also maintaining the percentage of students earning AP Exam scores of 3 or higher. During the 2017-18 school year, AP offerings in EPS high schools included courses in the subject areas of History, Biology, English, Chemistry, Calculus, Spanish, Statistics, Psychology and Government. In all, student enrollment in AP courses was over 1,800, with over 1,400 AP exams taken district-wide. 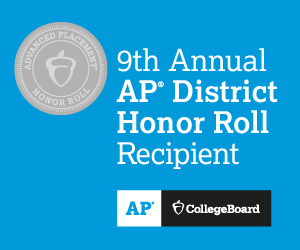 “Being named to the AP Honor Roll for the seventh consecutive year is reflective of the culture our staff has created to constantly raise the academic bar for all students. We’re incredibly proud of our students and staff for their commitment to continually strive for this level of academic achievement, “said EPS superintendent Dr. Bary Habrock. As Elkhorn Public Schools continues to experience significant growth throughout the District, and our student population progressively diversifies, the need for extra student support increases. As a result of this growth, EPS recently made the decision to transition our current, district-run Partners in Education Mentoring Program into a chapter with the TeamMates Mentoring Program. This school-based mentoring program, founded by Dr. Tom and Nancy Osborne, is an additional tool utilized by EPS to provide more structured support and encouragement for students, given the wide variety of backgrounds and interests that can be found in EPS students, while bringing more mentors into our program and allowing us to retain the majority of our current mentoring relationships already in place. TeamMates mentors are asked to meet with their student mentee once per week during regular school hours, within the school building. If you’re interested in making a difference in the life of an EPS student, please visit https://teammates.org/become-a-mentor/apply/ and choose “Elkhorn, NE” as your desired chapter. If you have questions regarding the TeamMates of Elkhorn mentoring chapter, contact Kara Perchal at kperchal@epsne.org or (402) 289-2579. Save the date for the upcoming production of Newsies (The Musical) presented by Elkhorn High School students! Show dates and times are below, and ticket information can be found by viewing the flyer. All performances will be held at Elkhorn High School. Welcome to the 2018-19 School Year at Elkhorn High School! Please use this site to navigate and complete all documents. Beginning this school year, parents will be completing many of the registration documents online via Parent/Guardian Account in PowerSchool.